My poor blog has been neglected, it’s not that I don’t love it but I’ve been on holiday. I’m currently in Philadelphia I arrived today from Boston. There are a few reasons I have neglected my blog, limited access to wifi plus the fact on a couple of days I completely forgot. Even though I have been on holiday technology has never been very far away from me. In fact it has rarely left my my hand. I have relied heavily on my iPhone. More specifically I have relied heavily on Google Maps. Google Maps has helped me navigate my way around cities I have never visited before. I can actually read a map but sadly I do have a terrible sense of direction and an even worse memory. So being able to press a button on my phone and have a little blue button appear on a map tell me where I am has been amazing. Google Maps has helped me navigate complicated public transport systems. Google Transit has helped me get from A to B remarkably easily. I’m have been amazed at how accurate and easy it has been to use Google Transit to get around. 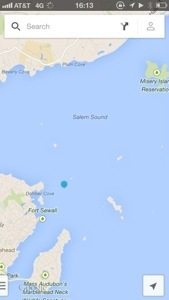 I was even able to take a screenshot of a map of my location when I was on a ferry from Salem to Boston. I know that may seem a little pointless but it made me happy. Probably the coolest function of Google Maps (and for the record Apple Maps does it too) Is finding things that are not usually listed on a map. Even though I could look in a phone book I would then need a street directory to work out where places are in relation to me. It is much easier with Google Maps, I was looking for a laundromat so I searched on Google Maps and I found 3 all with online reviews and pictures! So I picked the one with the best reviews and checked out the opening hours and I was good to go. I have also found cinemas, libraries and banks. My iPhone and I are having a great holiday and I will do better at loving my blog in the future.